Steam Controller testers are having trouble making the switch from traditional thumbsticks to its unique dual trackpads, says Valve. You may have noticed that the Steam Controller has gone through quite a few changes in its development process, which has led to the device being delayed from its original November release date to early 2015. Last we heard, the folks at SteamDB pulled out some "leaked" pictures of another redesign, this time featuring a single analog thumbstick. Steam neither confirmed nor denied the new prototype, but earlier this month, I was granted a tour of Valve's headquarters in Seattle, where I was able to confirm that this analog stick prototype indeed exists. While I was furiously scanning each room the tour went through for any instance of the number "3", I noticed a Valve employee using what appeared to be a fully-functioning prototype of the analog stick Steam controller. I spoke with one of the machinists working on the project, and he offered me some insight onto how the analog stick came to be. First up, he admitted that adjusting to the radical dual trackpads of the Steam controller is the biggest problem new users have. 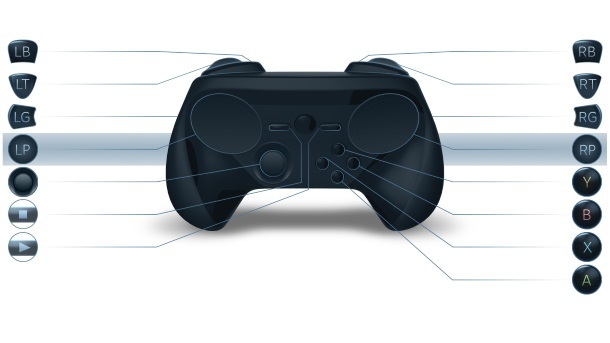 While he (and pretty much everyone else at Valve) swear that the dual trackpads are absolutely necessary, and that they really do make all the difference, it's not as easy to convince people who've never used them. The machinist said that the new prototype's analog stick was tied to movement, in order to "ease new players in" to using the two trackpads, by starting them off using just one for aiming. While he said that the prototype had been successful, and that players were eventually able to transition to the dual trackpad layout, its big disadvantage that the controller's d-pad had to be cut to make room for the stick. When I asked if an analog stick would make the final cut, he told me he wasn't sure, and said that the controller has been through a whole bunch of revisions already, and will probably have quite a few more before its release.